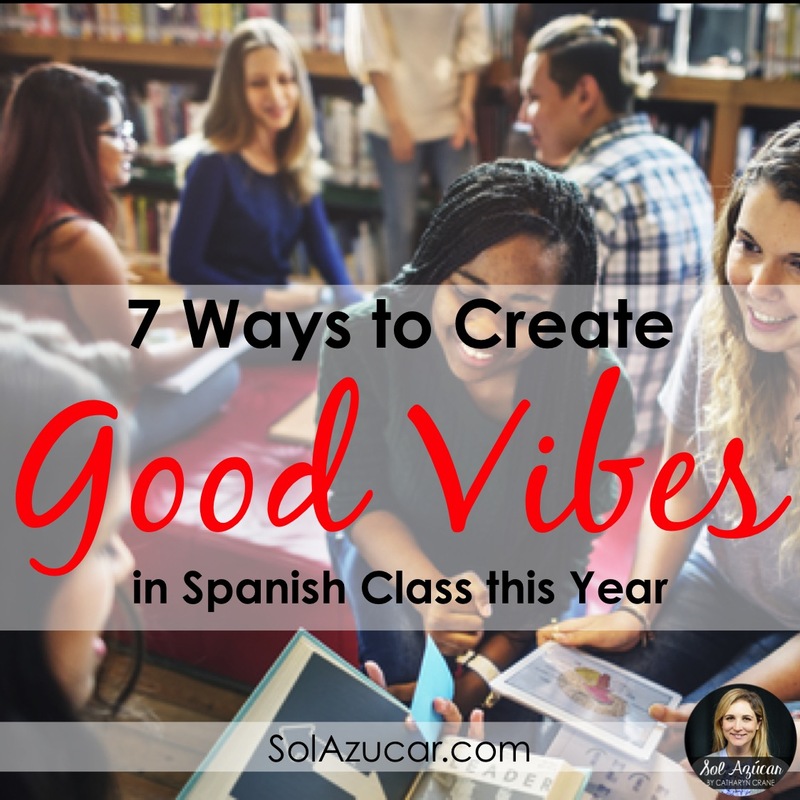 My previous post on Good Vibes in Spanish Class emphasized that when students like, trust, and care about their classmates, they will work hard together. They will speak up in class – ALL of them will. They create lasting friendships from being in your class. They will love you as a teacher, remember your class fondly, and have stronger learning outcomes. you must show them that YOU are also a part of the team. Share your personal self: The first week of school, I show a powerpoint presentation with pictures of myself, my family,and my real life. Continue to share personal tidbits throughout the year so students know you as a person. What did you do this weekend? What show did you watch last night? As language teachers, it is so easy to talk about these things because the fit directly into the communication standards! Show students that you are human too: I embrace my mistakes and shortcomings openly to students. Don't know how to say a word? I look it up in the dictionary. I model this for my students - we look it up as a class. I love the concept of teacher as “master learner”… even teachers have more to learn. Harry and Rosemary Wong were right: Students need to know from the start what is expected of them. If you have not read their book, "The First Days of School" get yourself a used copy ASAP. This is an oldie, but a goodie! Consider giving a formal presentation that first week or so of school, regarding your expectations. Lay it all out there. Then, FOLLOW UP! Be sure you consistently clarify your expectations and repeat them. Kids want to know how specifically they should behave in class and why. Wong & Wong's "The First Days of School"
If you expect your students to trust one another, you must first lead by example. How can teachers show their students they trust them? I’ve found that having nice materials (think: nice fresh sets of markers, extra pencils, extra paper, etc.) and a well-set-up classroom are great ways to convey your investment in the class. Clearly stating your expectations for how the space and materials are used is critical… as well as calling out the class publically if materials are not respected. BUT I do believe that having nicer things makes students feel trusted, and therefore more invested in the class! Make your students feel like they too "own" the classroom space. Get 'em moving: As a first step, I get students moving so they feel comfortable in our classroom space. All throughout the year, but especially the first few weeks of school, I aim to incorporate activities in which students move around and gain familiarity with the whole classroom. I want them to know that this is not a class where you can hide out in the corner all year! 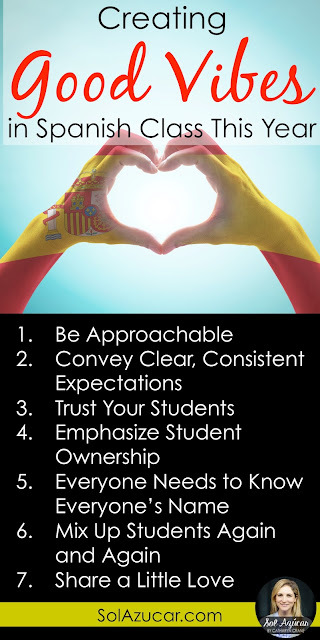 See the suggestions in "#5 - Get everyone acquainted" for some fun activities that get students moving. Give students responsibilities: I’ve had success assigning student responsibilities for classroom jobs (attendance taking, paper passing, getting their own supplies, etc.) so they have a real stake in the class and classroom, because they are leaders in the whole process. Value student feedback: Get students' opinions! I’ve periodically used classroom community feedback surveys to assess how students are feeling in the class. Asking for their opinions is a great way of showing that they have ownership and some control within the environment. Describe how you can improve your team presence next time? Everyone in class needs to know everyone else’s name. Period. Sometimes middle and high schoolers are just too cool for their own good. Not in my class. In my class, we are a team, we all work together, and value each other for our unique strengths. There is no "cool kid," "dork," "jock". Leave the stereotypes at the doorstep! I’ve had success with these ice breakers / get acquainted games. Best part is you can do these 100% in the target language! · Celebrities On Your Back Game: Teacher sticks a celebrity / character’s name to each students’ back. Students mingle with each other asking sí/no questions in Spanish to try to figure out which celebrity they have on their back. They’re limited to 2 or 3 questions with each peer, then have to move on. 4 Corners Activity: All students gather in the center of the room. Send a student leader to each of the 4 corners of the room, and give them your answer options, printed out on in large font on paper. Pose a question to the class, then corner leaders present their answers, and students move to the corner of the room that has the answer with which they best identify. Gesture Name Game: Form circles of 10 students or so. One student starts by giving his/her name and a gesture to go with it. The group repeats. Then it cycles to the next round where the next student presents his/her name and a gesture to go with it. Then the group repeats the first student’s name and gesture and then the second student’s. Go on through the whole group! Verdad, Verdad, Verdad, Mentira: In small groups (or whole class) students present 3 truths and a lie about themselves. The class (or group) votes on which is the “mentira”. Great for higher level students if you’re going 100% target language. Relatively easy prep for playing "Celebrities on Your Back"
Good vibes need to be cultivated all year long! I’ve had success using these class building activities throughout the year. These also can be done 100% in the target language! People Hunts: Also known as Human Scavenger Hunts, Find Someone Who, or the Autograph Game... For this activity students use a pre-made list of prompts to walk around the room asking questions in Spanish to find peers who can "sign off" ("firma, ¿por favor?") on their sheet. First student to get all prompts on their sheet signed wins. I love doing these thematically for the vocabulary and/or verb tenses we're focusing on at the moment. The prompts take a little work to make, but you can do it! Here are some of my People Hunt prompts as an example. Birthday Calendars: Make one for each class. Or assign a student or two to coordinate this. Great way to practice learning days and dates as well as acknowledging everyone’s special days. Fiestas: Unstructured socialization can also be a huge positive. 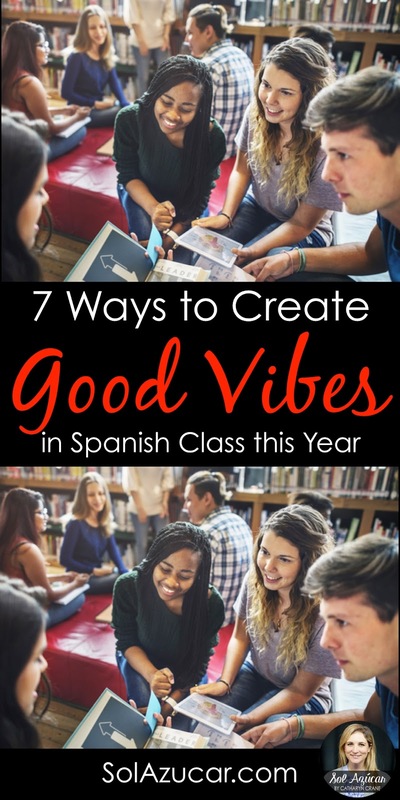 I usually throw 2 or 3 fiestas each year... as a celebration of Spanish culture (fiestas de familia are an institution in most Spanish speaking countries, after all), reward for good behavior/hard work, time for me to grade at the end of the quarter/semester, and/or general good will gesture. I almost always do a "working fiesta" where students bring food and drinks, but they work on class material while they party. Would You Rather: This is a derivation of the 4 corners game... but just uses 2 sides. Students all start in the center of the room, then the teacher (or a student!) poses a "Qué te gustaría más..." question to the class, and students physically move to the side of the room that they prefer. Pushes students' language skills while also exploring differences in opinions and conveying that all opinions matter. "¿Te gustaría más saber la fecha de tu muerte o no?" "¿Te gustaría más ser rico y feo o pobre y guapo?" Reach Out to the Whole Class: When students do great things, take time to acknowledge them. I love showing my favorite projects publicly to the whole class. Or consider presenting a bulletin board of top work from all your classes, for all to see. Reach Out to Individual Students: For ages, my department has successfully used postcards sent home as a way to build student and parent rapport. We print a big batch at the beginning of each school year, divide them up, and make a goal of sending out 5 every week. I keep a list of who I've sent them to, to insure I'm reaching new students each week. Students LOVE the individualized attention. I always write my note short and in simple Spanish... "Querida Namoi, ¡Eres una estudiante fabulosa! Gracias por toda tu ayuda esta semana en mi clase. Sinceramente, Señorita Crane"
Awards: I've given out end of the year award certificates, or superlatives to students in the past (they LOVE these!). But have a new idea for this year... giving little awards periodically throughout the whole year. This is something that elementary teachers do with much success, and I think there is value for secondary students as well. Everyone appreciates a little acknowledgement, after all. ¿Lo mejor de este día? ¡Tú! Who doesn't love a postcard from your teacher? These are just a few ideas. How do you build GOOD VIBES in your classes? Would love to hear your feedback. Excelentes materiales. 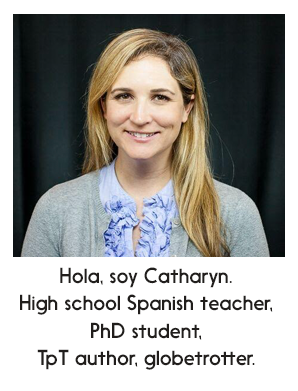 Tengo 35 años de experiencia educativa en Educación Física y ahora me dedicaré a enseñar español en MS o HS. Tus materiales me serán muy útiles. Where didi you get your postcards?